Extended height chair with footring features a 4" deep contoured seat upholstered in vinyl for full comfort. Adjusts from 23" to 33" high. Functions include pneumatic seat-height adjustment, manual back height adjustment, seat depth adjustment and 360 degree swivel. Chair holds 250 lb. Seat size is 17-3/4" wide x 16" deep. Back size is 16-1/4" wide x 14" high. 25" sturdy five-star base features dual hooded 2" casters. 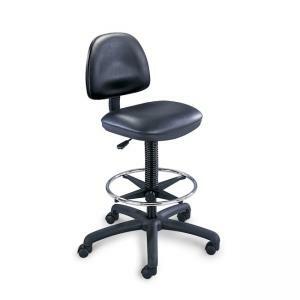 Adjustable footring and contoured seat provide full comfort. Chair meets or exceeds ANSI/BIFMA standards. Available in black frame only.